Norco is a prescription drug that is a combination of the opioid painkiller hydrocodone and acetaminophen. Enhance mental functioning. As mentioned above, Norco can cause confusion as well as concentration difficulties and mood swings. 11 Quitting the drug can bring mental clarity and allow you to be more productive. Confront shame and guilt. Many people with an addiction live a double life. They constantly feel like they have to hide their behavior from other people and feel guilty about their drug use. They may lie, steal, or do other things they wouldn’t normally do to obtain their drug of choice. Entering recovery means the person does not have to hide their addiction anymore and can confront any uncomfortable feelings or harm caused to other people. Improve your financial situation. Addiction is expensive. Not only do you have to buy the drug, but you also may have medical or legal costs related to the addiction. If you’re no longer using the drug, this money can go toward other things. In addition to the physical symptoms of Norco withdrawal, most people need emotional support during recovery. It is difficult to stop using a drug such as Norco when someone has become dependent upon it, and having the emotional support provided in a treatment program can be of great value in helping a person recover. Inpatient treatment may be necessary in some cases of Norco addiction. Not everyone needs this level of care, and whether it is appropriate for someone depends on many factors, such as underlying health issues, dependency on other drugs, and the severity of the Norco addiction. Inpatient usually includes detox, individual and group therapy, other group activities, and aftercare planning. Programs can last from 28 to 30 days to 60 days to 90 days. Outpatient treatment is often an option for treating Norco addiction. Programs can provide various levels of care and usually include group or individual therapy. Some programs meet every day for several hours, with participants going home to sleep at night. Less intensive programs may provide services a few times a week, for a few hours per day. For some people in recovery, outpatient treatment may be a step down from inpatient treatment. For others, it can be the only form of treatment that they receive. Individual counseling can be important for recovery from Norco addiction. 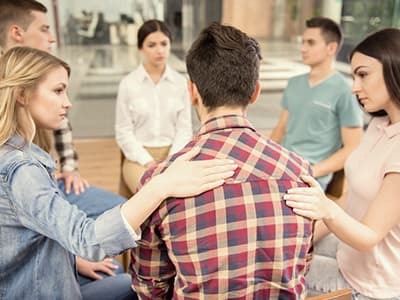 Cognitive behavioral therapy is a common form of addiction therapy that is designed to help change the thinking patterns that have led to drug addiction. 4 Individual counseling can help identify triggers for using Norco and treat any co-occurring mental health disorders, such as depression or anxiety. 12-step programs are available across the United States and are free. These programs, such as Narcotics Anonymous, Alcoholics Anonymous, Pills Anonymous, and others, are held in almost every community. While some people start their recovery from addiction by attending 12-step programs, most people use 12-step programs as a way to maintain their recovery after a treatment program. Members work through a series of steps with the help of a sponsor. The steps help the person recognize his or her powerlessness over addiction, make amends to people he or she has harmed, and assist other members with their recovery. The addiction recovery process requires a long-term commitment. The intense physical cravings, as well as dealing with everyday life as a sober person, can present a variety of challenges. Relapse is always a concern after treatment. Aftercare provides the necessary support needed for lasting recovery from substance abuse. Some people use 12-step groups as a way to continue their recovery process. Non-12-step groups are also available, and many people participate in these programs for ongoing support. There are also community support groups and groups run by therapists that can also serve as ongoing aftercare treatment. Still other people in recovery are more comfortable working with a therapist in individual counseling. However, people with severe addictions may be better served in a sober living facility, which provides oversight as well as job placement assistance and stable housing. These facilities can teach such skills as money management and provide more social support for people who need it. Whether the person used other substances in addition to Norco. How long the person was addicted to Norco. The amount of Norco he or she typically used. People who have used high levels of Norco for long periods of time will likely experience more withdrawal symptoms and have more difficulty during the withdrawal period. Dehydration. Occasionally, the severe nausea and vomiting that may accompany Norco withdrawal can lead to dehydration, which might require IV fluids or anti-nausea medications to stop the symptoms. Insomnia. Some people may experience severe insomnia and be given non-addictive sleep aids. Medically supervised detox provides both medical and emotional support. It may take place in a residential inpatient setting, a hospital setting, or in an outpatient setting depending on the severity of opioid dependence and the presence of any other complicating factors. Norco withdrawal is not usually life-threatening. However, the extremely uncomfortable physical sensations that often result from Norco withdrawal are difficult to handle alone. Further, having emotional support from therapists and other professionals makes the detox process and the management of withdrawal much easier. Naltrexone – This medication blocks the euphoric effects of Norco and other opioid drugs. It also does not cause any of the typical effects of opioids. Methadone – Methadone is a long-acting opioid medication that can help reduce cravings and withdrawal symptoms. It can be used to stabilize a person in detox or used as a maintenance medication over a longer period of time. However, it does have addictive potential. Buprenorphine – Buprenorphine has an opioid mechanism of action similar to that of Norco, but it is less potent and incapable of creating the pleasurable highs associated with painkiller abuse. It can be used to help reduce cravings and withdrawal symptoms, with much less addictive potential than the drugs it is intended to help treat. Are You Ready to Quit Norco? Who Answers? to talk to a representative about Norco recovery programs in your area. Get help for the underlying reasons of addiction. Addiction usually has a root cause (or causes), such as unresolved grief or trauma that needs to be dealt with in therapy. Otherwise, a person might stop using Norco temporarily, but quickly seek it out to deal with emotional issues that can resurface later on. Don’t try to detox alone. People often believe that they can quit Norco on their own. However, professional oversight is strongly recommended to withdraw from Norco. Quitting alone is extremely difficult, and most people relapse very quickly without the appropriate medical oversight to manage their withdrawal symptoms and the therapeutic support to help with the emotional needs of withdrawal and recovery. Build a support network. Recovery is difficult to do alone, and isolation can lead to relapse. Find friends and family you can reach out to for support and who can hold you accountable for staying sober. If your social circle mainly consists of people who use, try to make new sober friends through 12-step programs or support groups. Have a relapse prevention plan. Work with a therapist, a family member, or a friend on identifying your relapse triggers and how you can avoid them. Since some triggers are unavoidable, come up with ways to deal with these when they happen, such as counting to 10, practicing deep breathing, and distracting your thoughts. Develop new habits. Many people who are addicted to drugs or alcohol have developed a number of habits – even an entire lifestyle – around substance use. Work on establishing new habits that do not revolve around drugs, such as exercise, hobbies, and eating a healthy diet. Threats and ultimatums usually aren’t the best approach. It’s hard to quit using prescription painkillers, and many people will deny they have a problem despite the damage caused to their relationships, finances, or employment. You might be tempted to confront a friend or loved one with threats or ultimatums to get sober. But this isn’t always the best approach. Here are some tips for how to help a friend or loved one who is addicted to Norco. Remain calm. However frustrated, angry, or upset you may be from your loved one’s addiction, screaming, threatening, or behaving in a judgmental or confrontational way is seldom a helpful approach. Approach the person with care and concern. Tell the person that you want him or her to get help because you are worried about them. Sometimes, if you can at least persuade the person to attend an assessment with a trained professional, you might be able to motivate the person to accept treatment. Have information prepared to present to the person if he or she seems receptive. Research programs in your area and collect several options you can present to him or her. If the person feels like he or she has a choice, they may be more inclined to enter a program. Offer to support him or her in treatment. Your loved one may feel better about attending treatment if he or she feels supported. You can also offer to attend a 12-step meeting with them. Be prepared for resistance. Many people struggling with addiction will make several attempts to go to a rehab program before they actually accept treatment. This fear of getting help is very common, and even if the person walks away after the first attempt, keep trying to get them to agree to help. As mentioned above, Norco withdrawal is rarely life-threatening. However, medical and mental health complications can result. Even if someone does not have these symptoms, the extreme physical discomfort, such as sweating, clammy skin, nausea, vomiting, agitation, anxiety and muscle and bone pain make cold turkey withdrawal unbearable, and the majority of people who attempt a cold turkey withdrawal start using drugs again to alleviate the symptoms. Many programs are available to help with Norco withdrawal. They offer tapered detox or medically supervised withdrawal from Norco that help people avoid the unpleasant symptoms of cold turkey withdrawal. Call 1-888-319-2606 Who Answers? today to get help for you or your loved one’s addiction to Norco. A treatment support representative can verify your insurance coverage over the phone and provide you with treatment options based on your insurance.
. Food and Drug Administration (FDA). (2009). Acetaminophen and Liver Injury: Q&A for Consumers.
. National Institute on Drug Abuse. (2012). Principles of Drug Addiction Treatment. A Research Based Guide (3rd Ed.). Cognitive-Behavioral Therapy.
. U.S. National Library of Medicine (2013). Medline Plus. Opiate Withdrawal.
. American Society of Addiction Medicine. (2016). Opioid addiction 2016 facts and figures.
. Centers for Disease Control and Prevention. (2016). Opioid overdose.
. American Psychiatric Association. (2013). Diagnostic and Statistical Manual of Mental Disorders – Fifth Edition. Washington, D.C.
. Nabipour, S., Said, M.A., and Habil, M.H. (2014). Burden and Nutritional Deficiencies in Opiate Addiction – Systematic Review Article. Iran Journal of Public Health 43(8):1022-1032.
. National Library of Medicine: Medline Plus. (2016). Hydrocodone Combination Products.